They don't call it the seven-year pen for nothing! Hidden inside is a jumbo ink cartridge that holds enough ink to write for two meters, every single day for seven years (5,110 meters, more than 3 miles of ink)! Imagine it: just two pens would last a child from kindergarten to high school graduation! (You'll have to get them a third one for college and grad school, though.) Made in Switzerland. 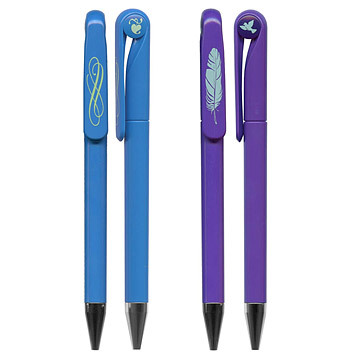 Available in Blue Swirl (left) and Purple Plume (right). I received this pen Christmas last. I placed it on my desk to avoid losing it, and used it for writing the few checks that I write because it was very smooth. Today,June 18, 2012 it skipped quite a bit as I began writing. I handed it to my wife because I thought the paper I was using to test it might be the problem. She said it did skip and stop putting ink on paper for her too. I bought this pen when I was Christmas shopping, so either in late November or early December. It's April 22nd and I'm sad to report, it is now dead. I absolutely love how smooth it writes, and how bold the ink is, but really was hoping that if not seven years, that it would at least last me one. It was my FAVORITE pen. I am a university student and I do a lot of writing. I also consider myself somewhat of a pen-snob, I have a pen fettish, lol. This pen was great and I love how it writes, but unfortunately after using it as much as I could (I wanted to see if it really would last me seven years, or even half of that) it only ended up lasting me about 7 months instead of seven years. I am sad that it is out of ink now, but I am not sure I want to pay for another one if it's not going to last any longer than a normal pen you can get for much cheaper. I use this product to take notes in class. I'm a sophomore in college, bought it at the end of last year, and the ink already ran out. I would not recommend this pen. Perfect!!! How else can you describe perfection?? It is the best pen I have ever bought and will only use another pen if I lose it!! I will be ordering more so my friends can see perfection at it's finest!!!! I am a dramatist and a journalist. I interview people in person, sometimes standing up in a crowd, and I also write my manuscripts in long hand. Have been using this pen now for over a year . . . every day. Very satisfied. I'm tired of finding "dead" pens in the bottom of my bag. This pen is great! I'll be buying more for every college bound kid I know. I LOVED this pen!!! And that's says a lot coming from a pen snob!My problem was my own fault...I washed it and it didn't survive... Although to it's benefit it didn't explode!! This pen ran out of ink after TWO DAYS! All that I was able to use it for was to write a short note and one grocery list -- that was it. The advertising for this product is so false, it's practically criminal. I use this pen for college. I was ecstatic when I learned about this pen, because I only needed one pen instead of 3 in my bag in case one ran out. It has a beautiful design, and writes so smoothly with perfect ink that's bold and clear yet doesn't smear. I used it about a year and it has now run out of ink. so sad,but not worth the money even if it is perfect in every other way.